Galwegians revel in enjoying themselves. The city has a reputation for artistic creativity and an infectious up-tempo vibe that`s played out in a full calendar of festival and events. 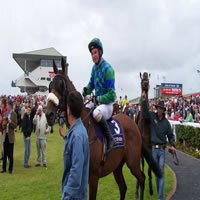 From music and horseracing to literature and oysters, Galway knows how to celebrate. Throughout the year there`s a festival atmosphere that gives this place a special edge. It`s no wonder people pour into the traditional pubs and lively bars every weekend. 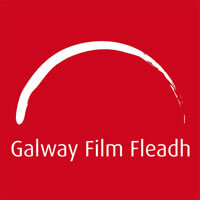 The flamboyant arts scene comes alive in the summer and attracts visitors from all over the world with a whirlwind of activity that includes the much-trumpeted Galway Arts Festival, and the intimate, critically acclaimed Galway Film Fleadh, both in July. And if it`s social glamour you`re after, then don a fancy hat and head to the Galway Races, when 250,000 people converge at the Galway Racecourse for equestrian high-jinks that last a whole week. 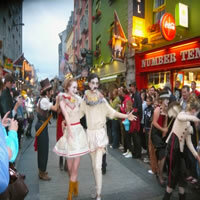 While the summer may come to an end, festival season certainly doesn`t in Galway and one great festival season rolls into another. Each September, Galway City comes alive with seafood & oysters as it celebrates the Galway International Oyster & Seafood Festival, the most internationally recognized food festival in Ireland and the world`s longest running International Oyster Festival. Sample the delights of the Atlantic Ocean washed down with a nice cold pint of Guinness.